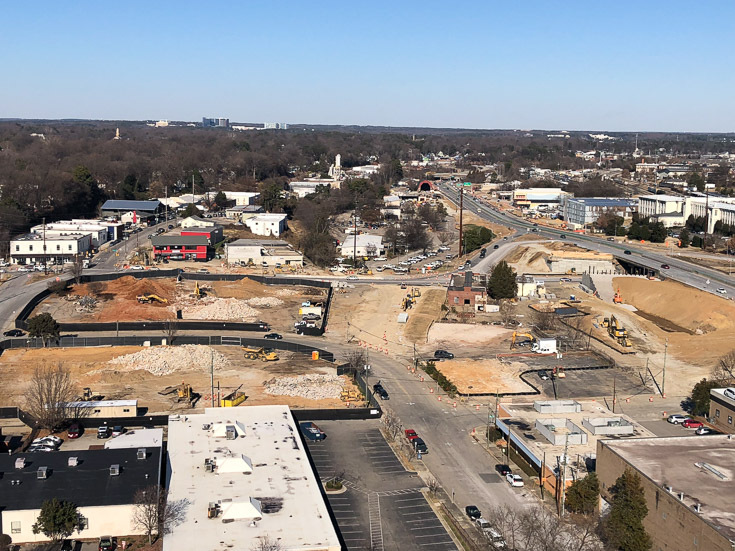 There has been a lot of change along Peace Street this year and Phase 1 of Kane Realty’s development along Peace, as well as Harrington and West Streets, is really starting to take shape. 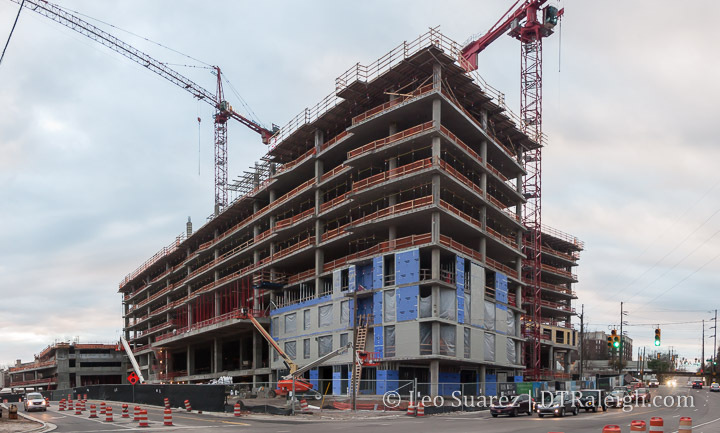 The apartment building at Peace and West is close to topping out and siding is already starting to go up. The parking deck behind this tower is catching up also. There will be plenty to watch here into 2019 as the rest of Smokey Hollow unfolds. Corner of West and Peace. June 2018. 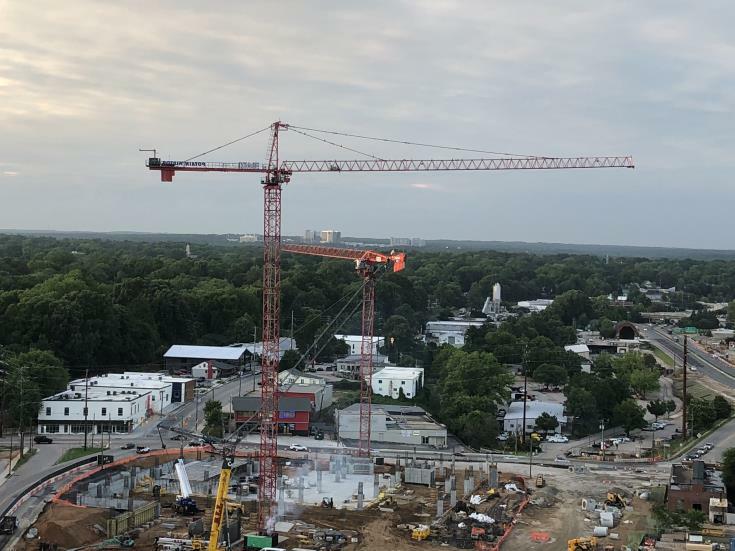 With two cranes now operating over the Smokey Hollow site, I thought it would be a great time to walk around and check things out on a nice June evening. 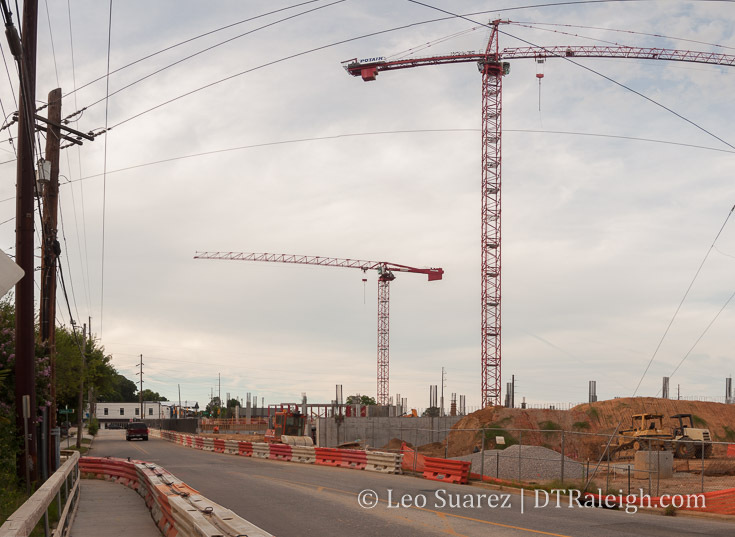 Nearby, the new Capital Boulevard bridge is also being worked on and it seems like all of these things are part of a wave that wants to open around the same time. 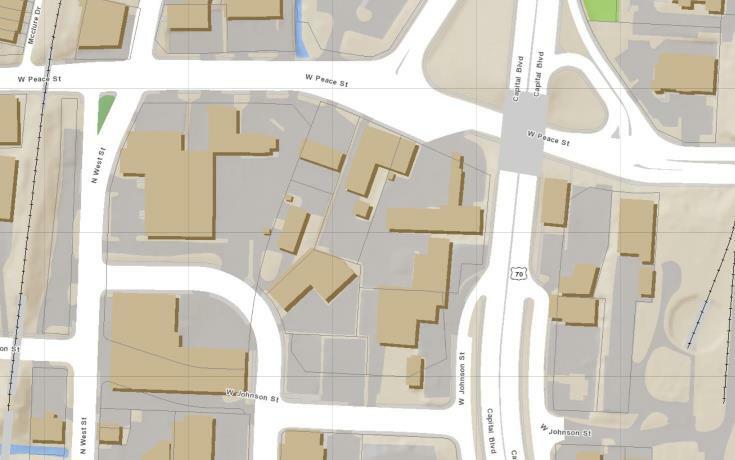 First, we need to review the new street configuration coming to this area. 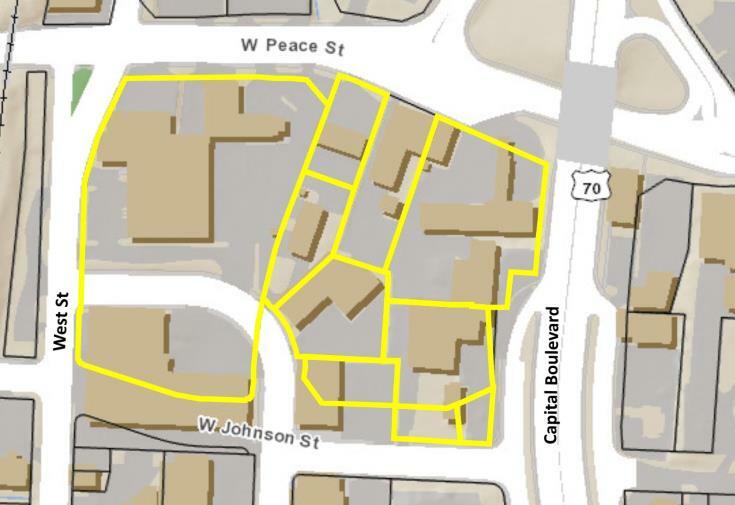 Parts of Harrington Street have been removed while Johnson Street will become reconnected. See the before and after maps below. 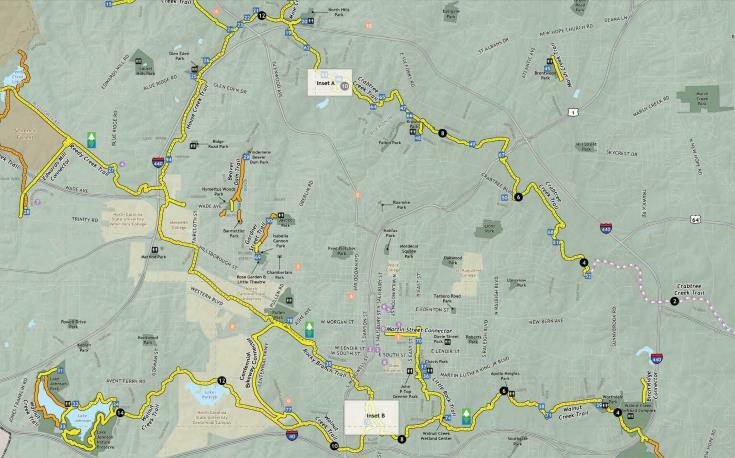 Map of Smokey Hollow area before 2018. 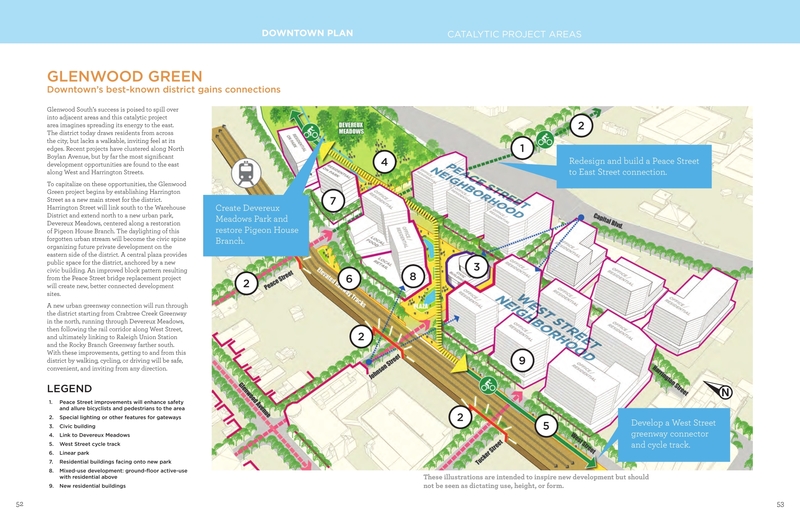 The “Harrington Curve” is now gone and instead extends the street to Peace. 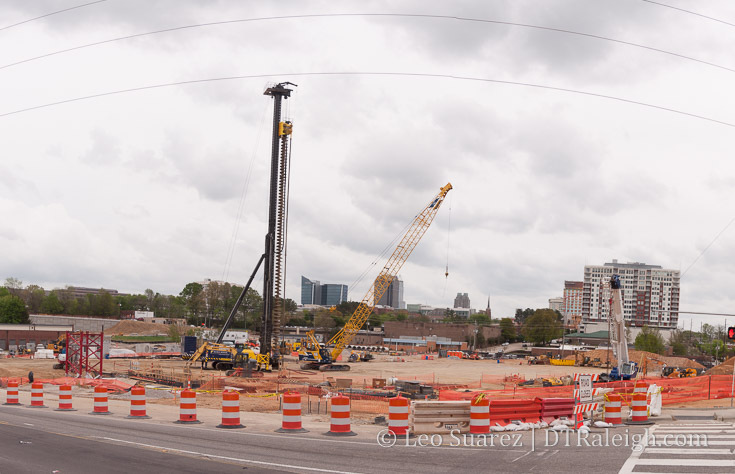 At the intersection of Johnson and Harrington, you can see the future extension as the buildings have been cleared. Here’s where the walk starts staring to the north. Intersection of Harrington and Johnson. June 2018. Getting to West from this point is basically a pedestrian/bike only alley as the new Johnson Street connection isn’t in place yet. Along West Street heading north to Peace, we can start to see the buildings of Peace at West starting to come up. 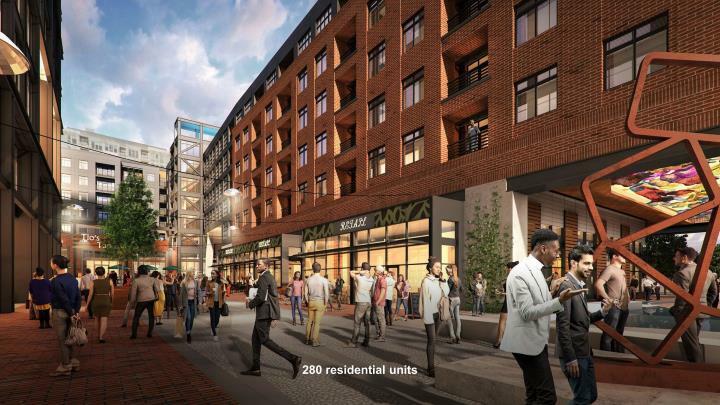 What was once an area of suburban-style, one-story buildings will now have 12-story towers along new urban sidewalk. The change will be quite dramatic and there’s plenty of space for more. West Street near Johnson Street. June 2018. The building is just starting to rise up so you still have to use a little imagination to get a sense of what the intersection of Peace and West will look like in the future. 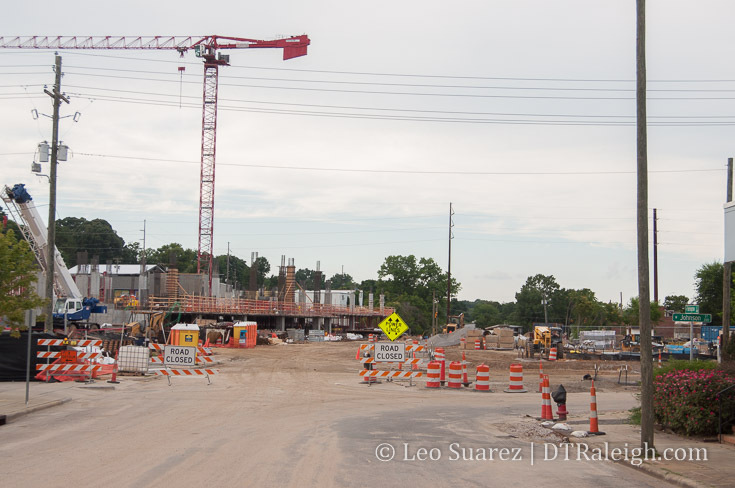 Soon, Peace Street will start to resemble its future self as more lanes open up as part of the bridge construction. 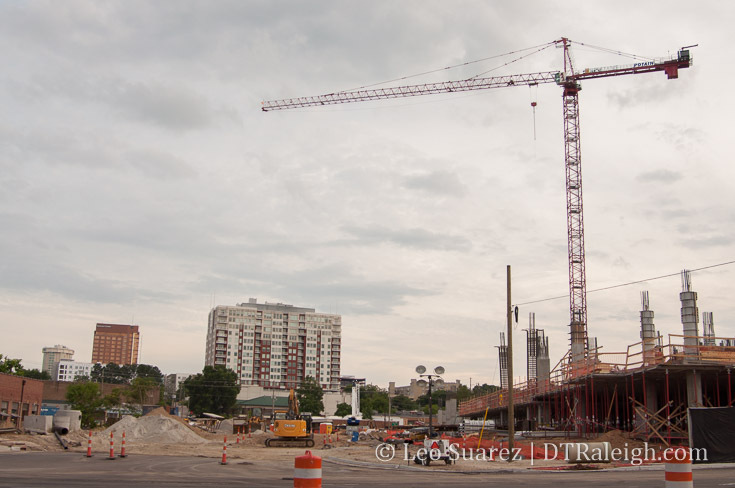 Enjoy that view looking southeast while you can cause this building will go up fast! West Street at Peace. June 2018. There are temporary lights at the future new intersection of Harrington and Peace where you can look towards the south at the beginning of this walk. 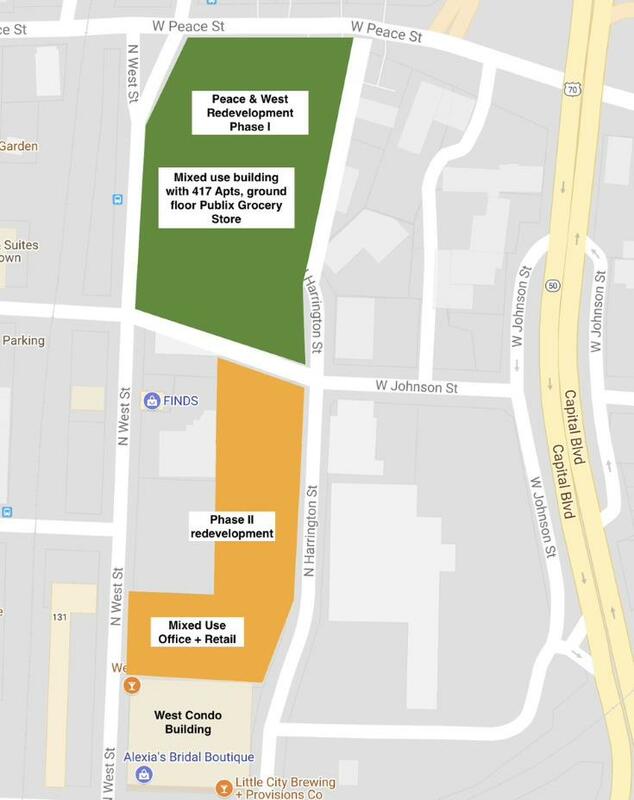 No doubt, Peace at West will hug some prominent streets, basically all the ones we’ve discussed. Peace at the future intersection with Harrington. June 2018. 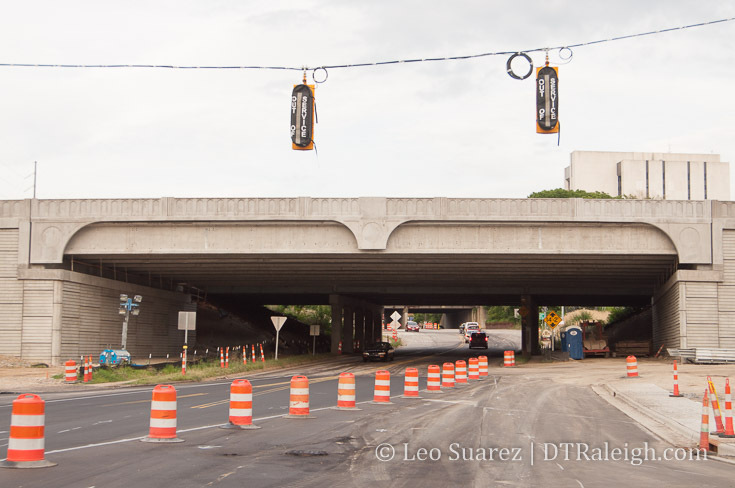 New Capital Boulevard bridge over Peace. June 2018. Getting back to our starting point takes us south straight down the future Harrington Street to its intersection with Johnson. 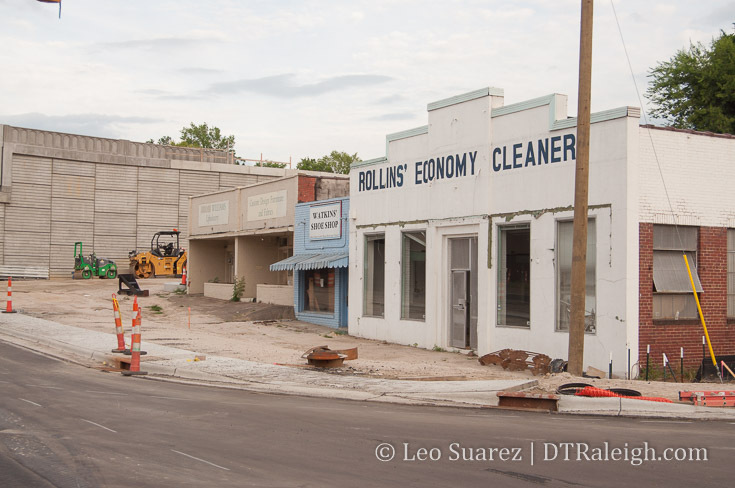 The Rollins Cleaners and other older buildings are still up on the eastern side but that may not be a surprise as demolishing a dry cleaner typically involves extensive environmental cleanup efforts that take years. I wouldn’t be surprised if that is the case at this site. Buildings along Peace Street. June 2018. 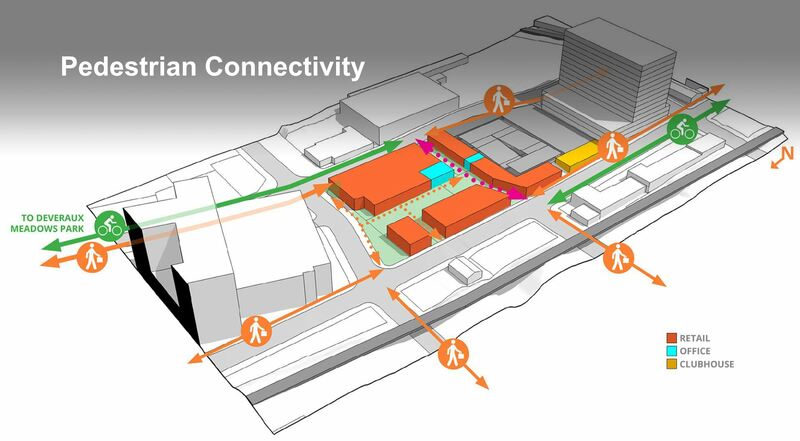 Future Harrington Street. June 2018. We’ll check back in later for sure! Join the conversation on this project over at the DTRaleigh Community. 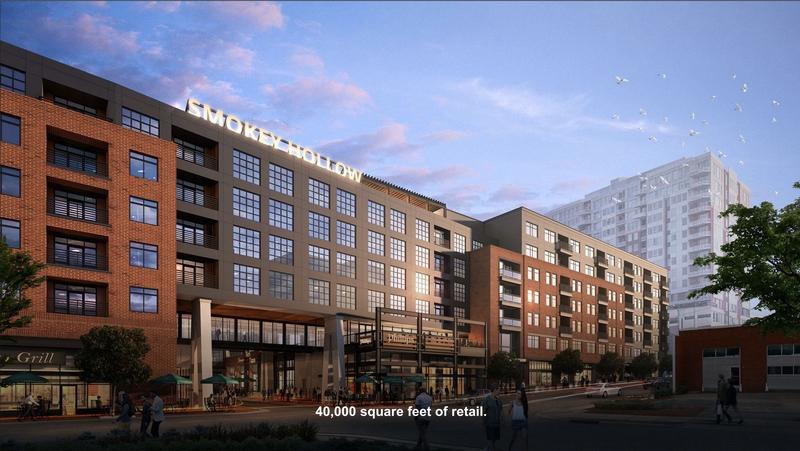 The photo above shows the site of Peace (unofficially Smokey Hollow), the 12-story apartment building planned at the corner of Peace and West Streets. Foundation work has been going strong for awhile and recently, I noticed the foundation for a tower crane pop up. Seems like we’ll be seeing this project rise up soon. 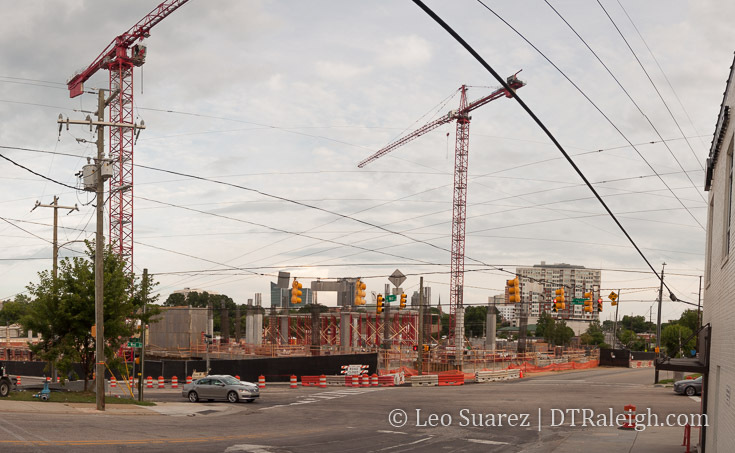 One day, I was riding south into downtown on Capital Boulevard and caught a glimpse to the west towards Glenwood South. The clearing of so many buildings just struck me and I had to come back to take some photos. This would have really been nice to have a drone for this post but either way the photo above attempts to show how much has been cleared. 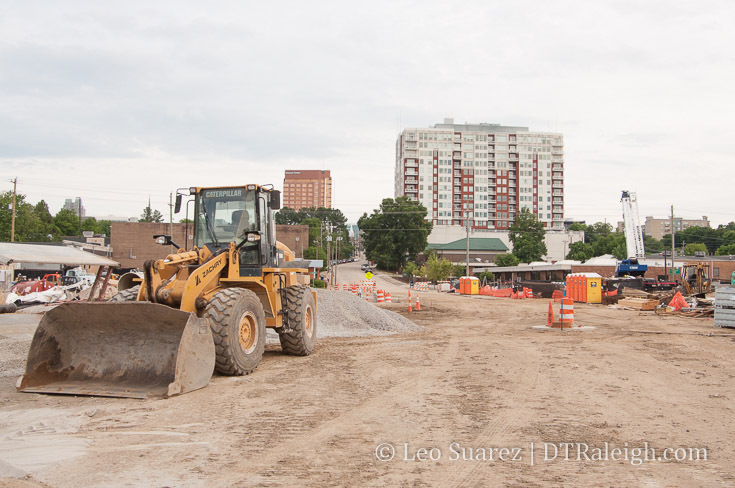 Between Johnson and Peace, Capital and West Streets almost all buildings have been demolished this year. With the help of iMaps, I estimate about 6.5 acres have been cleared in just this area. Well, probably not. 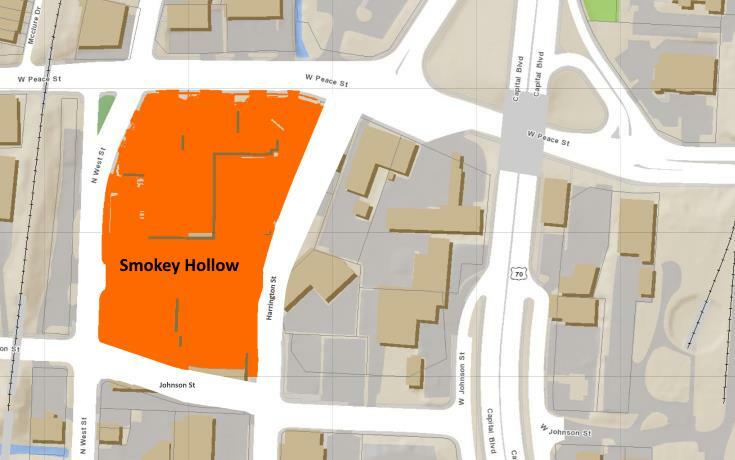 A residential neighborhood, the late Smoky Hollow, isn’t being cleared again but the state is still flexing its eminent domain muscle for highway improvements. Let’s hope this time it sticks. Click for larger. 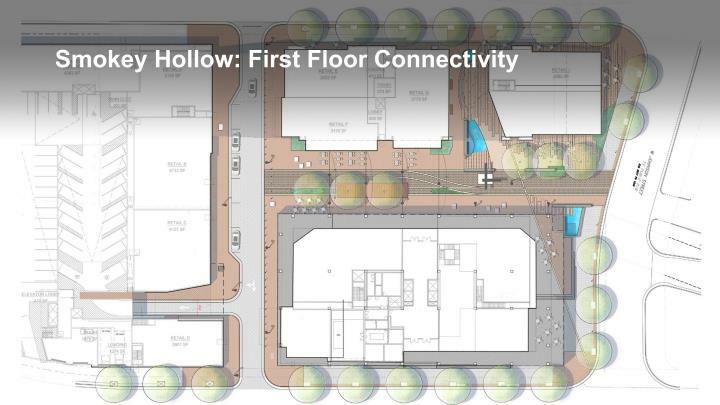 Note the new Johnson Street connection already planned for. Next, the Harrington connection to Peace. 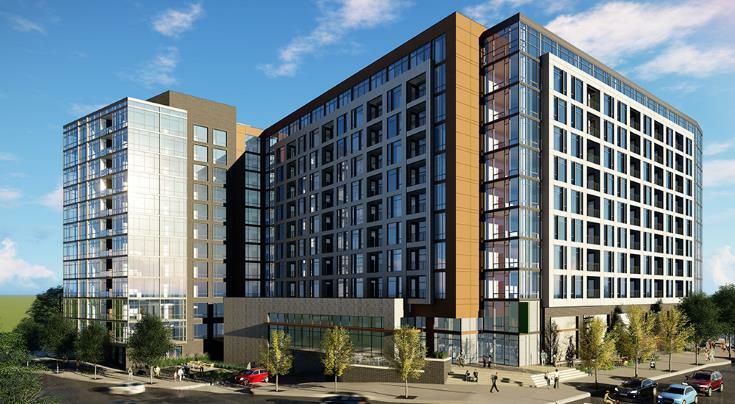 First to watch is the 12-story residential tower called Peace, formerly Smokey Hollow, at the corner of West and Peace Street. 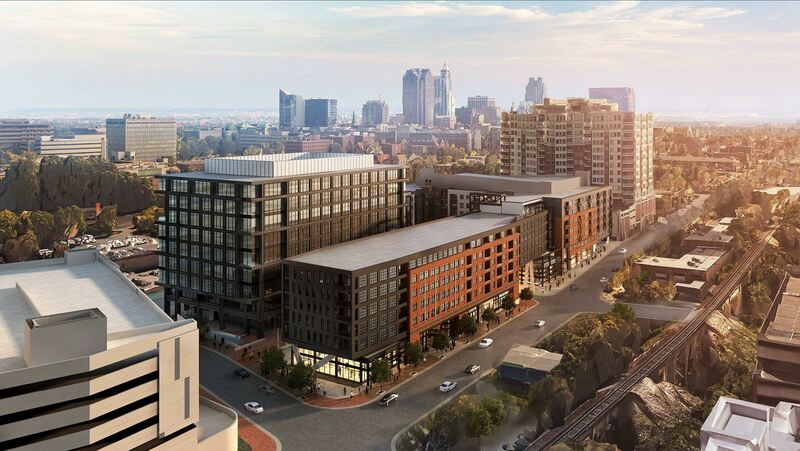 It was announced that a Publix grocery store would anchor the ground-floor space of this project. I bet that’s a huge selling point for more development in this area. For more views, here’s a VR shot I took while up there. If you can’t see the embedded VR view, try seeing it directly on the blog.